The summit of the Hill of the Muses (Philopappos) is excavated under the supervision of Andreas Skias, the objective being to find the architectural elements of the monument of Philopappos and to determine its design. During the roadway opening for the transportation of stones from the quarry of the area, a large square tower of the Macedonian fortress comes into a light. In the same year, an excavation by the Observatory, supervised by Georgios Sotiriadis, exposes many cremations, but also drain pipes from earlier settlements, clay moulds and thirteen inscribed funerary kioniskoi. Skias 1898, 70–71; Travlos 1960, 80, 122. 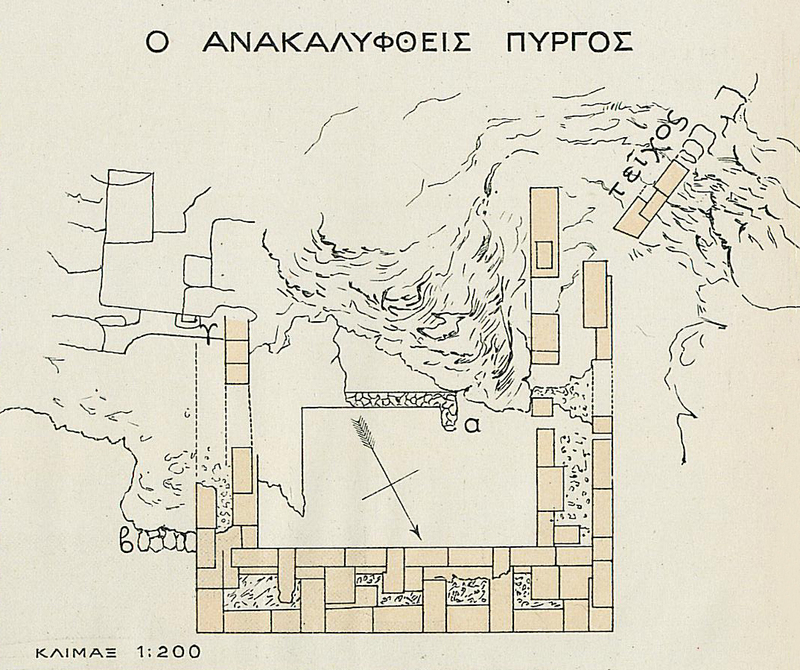 A drawing of the fortification tower that was discovered during an excavation in 1898, on the Hill of the Muses (Philopappos). The tower was part of the Macedonian fortress that was built in 294 B.C. when Demetrios Poliorketes was in charge of the city.